The Fagatele Bay sanctuary staff works closely with its American Samoa government partners to promote sound use, conservation and awareness of the sanctuary's marine environment. The sanctuary staff also works throughout the territory to help the people of American Samoa understand and better utilize its marine resources. The American Samoa government coordinates all of its territorial coral reef management activities through the Coral Reef Advisory Group. This group comprises both territorial and federal agencies, including the American Samoa Department of Commerce (which includes the American Samoa Coastal Management Program and Fagatele Bay sanctuary), the Department of Marine and Wildlife Resources, the American Samoa Environmental Protection Agency, the American Samoa Community College, and the National Park of American Samoa. These agencies collaborate to plan and implement actions related to the management of the territory's coral reefs. Each agency within the Coral Reef Advisory Group has specific projects and programs that enhance the quality of marine habitats, regulate activities on coral reefs, promote awareness, and facilitate research into various aspects of coral reef science. The Coral Reef Advisory Group helps to coordinate these efforts and build collaborative projects using a threat-based approach to identify key problems on American Samoa's reefs. In tandem with this, the advisory group has also created four three-year action strategies to address the issues of overfishing, global climate change, land based sources of pollution, and population pressure (the first three were identified in this report as significant concerns for Fagatele Bay sanctuary). The U.S. Coral Reef Initiative has been instrumental in supporting the territory in its coral reef conservation activities. The Coral Conservation Grant Program has provided managers and scientists in American Samoa with staff, funds, and equipment with which to accomplish key research and management projects. The sanctuary staff works with the Coral Reef Advisory Group's education and outreach coordinator to increase public awareness of issues affecting American Samoa's coral reefs. In addition to regular school visits, current projects include education grants to teachers for the materials and supplies necessary for coral reef lessons and projects, development of marine education brochures and production of a monthly newspaper article, published in both English and Samoan. The Coral Reef Advisory Group is spearheading an effort to bring a marine laboratory and learning center to American Samoa. This facility will be designed to support the territory's marine research needs and build local capacity in the marine sciences. The facility may also house Fagatele Bay sanctuary offices and a sanctuary visitor's center. The Coral Reef Advisory Group is seeking partnerships with U.S. and regional institutions to support this endeavor. With its low human impact, Fagatele Bay provides a baseline for other sampling sites around Tutuila; therefore, partner organizations have begun collaborating in monitoring the water quality in the Fagatele Bay sanctuary. Water samples collected by the American Samoa Community College and analyzed by the American Samoa Environmental Protection Agency are used to measure Enterococcus bacterial concentrations. This collaboration is important in assessing how development of land, such as forest clearing and agricultural development, around Fagatele Bay may affect its water quality in the future. American Samoa water quality standards and sanctuary regulations aim to prevent any reduction in water quality in Fagatele Bay. Fagatele Bay sanctuary staff is also working with the NOAA Pacific Islands Fisheries Service Center to monitor water temperature. Near real-time water temperature is now available on the web through the Coral Reef Ecosystem Division of the National Marine Fisheries Service, Pacific Islands Fisheries Center. With the assistance of U.S. Geological Survey scientists, a proposal is being prepared to assess the groundwater beneath the island landfill to determine if contaminants are leaching into the aquifer and being transported to the marine environment. The landfill is on the other side of the ridge, immediately north of the sanctuary. Geologists believe groundwater beneath the landfill may flow south toward Fagatele Bay and/or Larson's Bay, and may discharge in coastal or submarine springs. National Marine Sanctuary Program regulations prohibit activities that disturb or damage the natural features of Fagatele Bay sanctuary. This includes destructive fishing methods and anchoring. With the help of a recent NOAA research cruise to American Samoa, two mooring buoys were installed in the sanctuary in 2006 to eliminate the need for boats to anchor. Submerged logs were also removed from the reef to stop their movement and prevent damage to corals. Fagatele Bay is divided into two subzones that regulate where certain fishing activities can occur within the sanctuary. Zone A includes the area from the high water mark of the inner bay to a line between Fagatele Point and Matautuloa Point. Zone B covers the area between the boundary of zone A and a line between Fagatele Point and Steps Point. Present sanctuary regulations prohibit removing or disturbing any marine invertebrate or plant in either zone. Most fishing gears are excluded from the sanctuary. The fishing gear that can be used in zone B are fishing poles and hand lines, both of which are prohibited in zone A. The use of other fishing gears, including nets and spears, is prohibited in both zones. All sea turtles are protected, and ensnaring or trapping them is prohibited in the sanctuary, as well as anywhere in American Samoa waters. 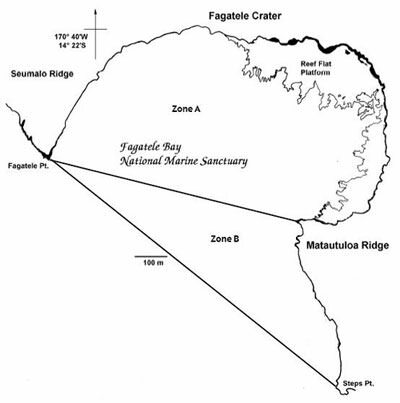 Map of Fagatele Bay sanctuary showing zones A and B, which regulate fishing activities. The use of fishing gear is prohibited in zone A and only line fishing is allowed in zone B. The sanctuary protects marine mammals and birds from "take," disturbance and harm. 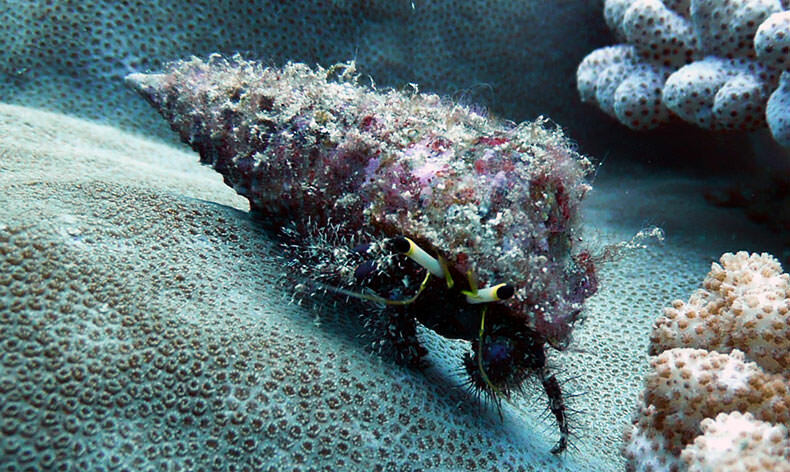 These animals are also protected in territorial and federal waters under theU.S. Marine Mammal Protection Act, the Endangered Species Act and the Migratory Bird Treaty Act. The sanctuary staff coordinates scientific research and monitoring of the ecological conditions in the bay. The program has built collaborations with local scientists of the Department of Marine and Wildlife Resources, as well as U.S. university-based scientists, to conduct regular field assessments of coral and fish populations, coral diseases and other indicators of coral reef health in Fagatele Bay. The data collected adds to one of the largest coral reef monitoring datasets in the world, helping to gauge the long-term patterns of change and recovery from events that have disrupted the ecosystem in the past and may cause disruptions in the future. A summary of data collected over 25 years of monitoring in Fagatele Bay will be published in a book chapter by Dr. Charles Birkeland in 2008. The sanctuary looks forward to using this information to make informed management decisions, evaluate the effectiveness of the monitoring program itself, and update the sanctuary's management plan. Fagatele Bay also has a substantial geographic information system (GIS) data archive, developed in partnership with the America Samoa Department of Commerce, NOAA and researchers at Oregon State University and University of South Florida. GIS data are available from shallow-water multi-beam bathymetric surveys, submersible dives, and ecological surveys conducted from 2001-2006. NOAA's Coral Reef Ecosystem Division collected substantial mapping and ecological data on three research cruises to American Samoa and is compiling much of the information for Fagatele Bay into a report and database. Near real-time sea-surface temperature and other oceanographic data are also being collected. As the Fagatele Bay sanctuary undergoes its management plan review, considering its role in protecting living resources from exploitation and harm will be a priority. One of the most important areas for improvement is monitoring the levels and type of use of sanctuary resources. This may include remote video monitoring of the site for tracking both allowed and illegal uses. The sanctuary will be looking to the Samoan people to play a significant role in determining the future of fish and other marine life populations within American Samoa's territorial waters. Although no maritime archaeological artifacts have been identified in Fagatele Bay sanctuary, regulations prohibit the removal, damage, or disturbance of any historical or cultural resource within the boundary of the sanctuary.